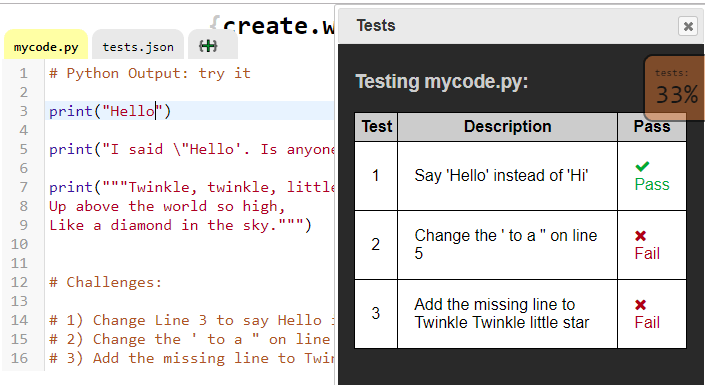 Create.withcode.uk lets you write, run, debug and share python code in your browser. It’s designed for teachers and students to enable a more creative and collaborative approach to learning python. In September, I started publishing a series of self-marking tutorials to walk beginners through their first steps writing, running and understanding python code. I’ve still not finished that series, but whilst creating the resources I found that I kept forgetting how to define the tests that run whenever you run your code in order to let you keep track of which challenges you’ve solved. It’s worth pointing out that these self-marking python activities are not designed to be robust enough for use in tests or exams. They’re a learning tool not a testing tool: there’s plenty of ways that you could cheat if you knew what you were doing and there are plenty of ways that you could write code that ‘works’ but doesn’t pass the test. Creating your own self-marking tests is time consuming but hopefully very worth while. I’ve created a series of self-marking python tutorials for beginners here which you’re welcome to use or adapt as a starting point. I hope this guide will be useful.